Preyas Diablo spawned from a Preyas egg which hatched into two brothers one good and one evil. Diablo is a tough, devilish Bakugan with an appetite for fiery destruction. Diablo's horned head has fearsome fangs and its winged body is covered in spikes. It can breathe underwater and has fast reflexes. It's abilities are medium-powered and can be very strong because it can change it's attribute. 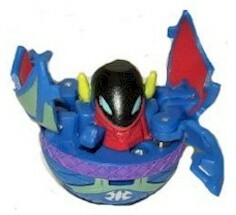 Purchase your Bakugan Diablo from Amazon now!